Tianmen Mountain National Forest Park, the second national forest park in Zhangjiajie City, is located in the north western Hunan Provice of China, only 8 kilometers from the city proper of Zhangjiajie. The park is a super holiday resort integrating with miraculous geomorphologic landscapes, temples, local culture, relics of humanity, wild animals, primitive forests, and so forth. Standing at 1518.6 meters, Tianmen Mountain is the first recorded mountain in the history of Hunan Province and has been revered as the "Soul of Zhangjiajie". The mountain boasts intact primitive forest, numerous rare tree species and medicinal herbs, and abundance of fauna. Tianmen Mountain Cableway, the longest passenger cableway in the world, has 98 cars and 57 brackets altogether (including 3 rescuing brackets), all of which are original imported facilities from POMA, the French corporation. The cableway has a total length of 7455 meters and a height gap of 1279 meters. 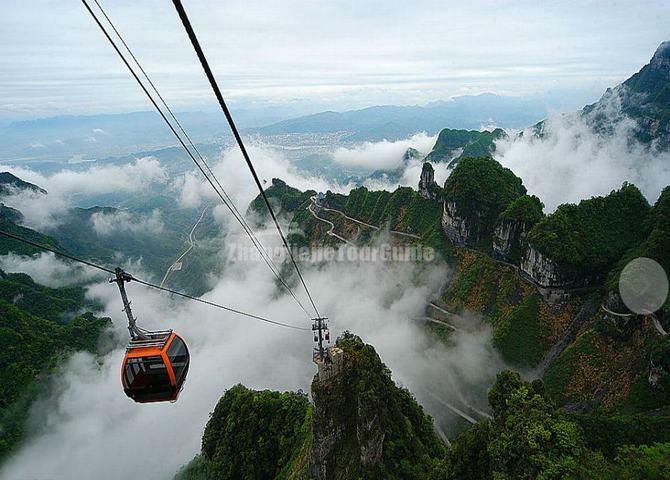 It is one of the few cable cars within China with a height gap over 1000 meters. The local gradient from the middle station to the upper station is as high as 37 degrees, which is rare in the world. 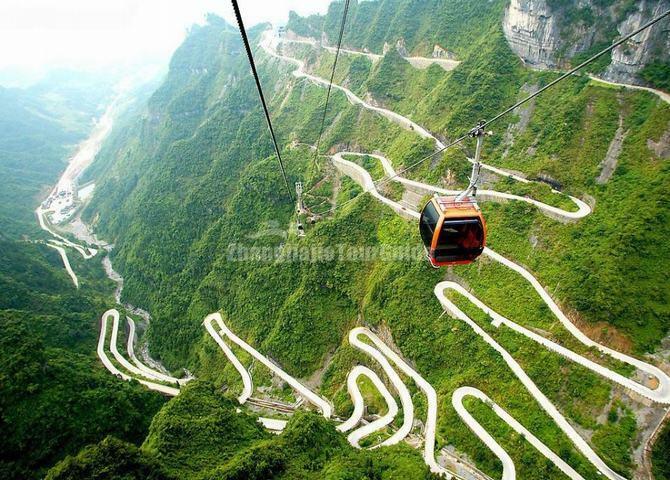 It is the cableway with the largest local gradient as well as one with most brackets in China. Tianmen Mountain Temple was first built in the Tang Dynasty (618 - 907) as a center of Buddhism in the area of western Hunan. 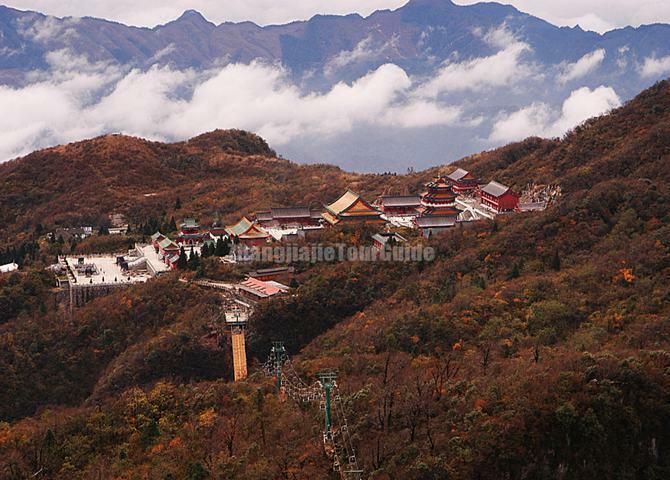 The present Tianmen Mountain Temple is rebuilt on the basis of the original site with a plot area of more than 10,000㎡. It adopts an official style of the Qing Dynasty(1636 - 1912) and the buildings in the Temple compare well with the famous classical houses at home. The Temple is located in the mountain hollow with a broad vision. If one gazes into the southeast, all the hills seem to be so small that the Temple is really like an overlord. 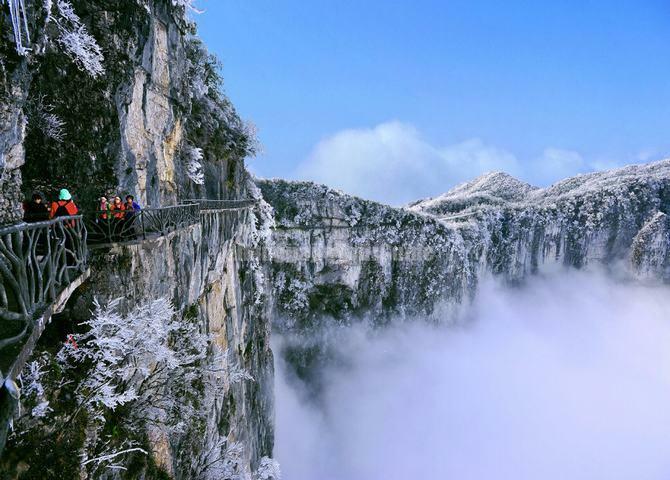 Built along the cliffs, the plank road in the Ghost Valley (Guigu) is measured 800 m in length and suspended more than 1,400 m above sea level on the upper side of the Guigu Cave. Here your hearts will be agitated by the extreme shock and stimulation. Tiamnen Cave, or Tianmen Gate is the natural water-eroded cave with the highest elevation in the world. In 263 AD, the thousand-meter high cliff of Songliang Mountain suddenly broke open into a door-like cave which became a rare wonder of the world. 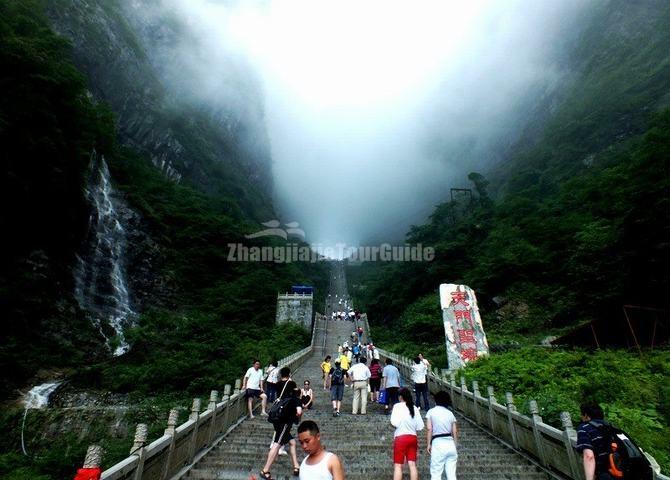 Hence Songliang Mountain is change to Tianmen Mountain. Tianmen Cave runs south-northward with a height of 131.5 meters, a width of 57 meters and a depth of 60 meters. It rises above the ground and nears the sky with a lofty and towering posture. The shadow of it reaches the north of the vast sea, the clouds over it near the south of the handle of the Dipper. It's much like a gate towards the heaven. The wonder attracted the visits and appreciations by emperors, officials, sages, hermits, dignitaries and men of letters of different dynasties. After the accumulation over the dynasties, the unique profound Culture of Heaven is built up. In 1999, the masters of international stunt flying piloted the planes to fly through Tianmen Cave. The activity gave rising to sensational reactions in the world. There were 800 million audiences watching the live. Heaven-Linking Avenue has 99 turns symbolizing that the Heaven has nine palaces. The avenue runs upward with the posture of the mountain like the soaring of great dragon and also hangs like a jade belt with zigzag turns circling the hills. It is known as the top wonder of highway in the world. Through Heaven-Linking Avenue, one can reach directly Tianti (the celestial ladder), where the grand celestial-like scene came into view. To reach the platform towards the Tianmen Cave you have to ride the shuttle bus service and go through the spiral road of Heaven-Linking Avenue. From above the cable car, the view of long winding road which looks like a dragon ascending from the mountains is just wondrous. It just makes you more impressed on how the Chinese were able to build structures like this and how long they made it. Tianmen Mountain is an integrated synclinal geological unit which has the landform of middle-mountain karst platform with peak groups and canyons. The top of Tianmen Mountain is a cliff sight of karst platform. The karst hillocks and karrens spread wildly to form wonders of stone forests in the air. Moreover, with moss spreading all over the ground, wild vines twining and twisting, what come into sight are natural bonsais like grand gardens which were as if created by the immortals. The tourists can relish the natural wonders and feel the miracles of the Creator to their hearts' content. Yunmeng Fairy Summit (literally translated as Cloudy and Dreamlike Fairy Summit), 1518.6 m above the sea level, is the summit of the Tianmen Mountain and Zhangjiajie. 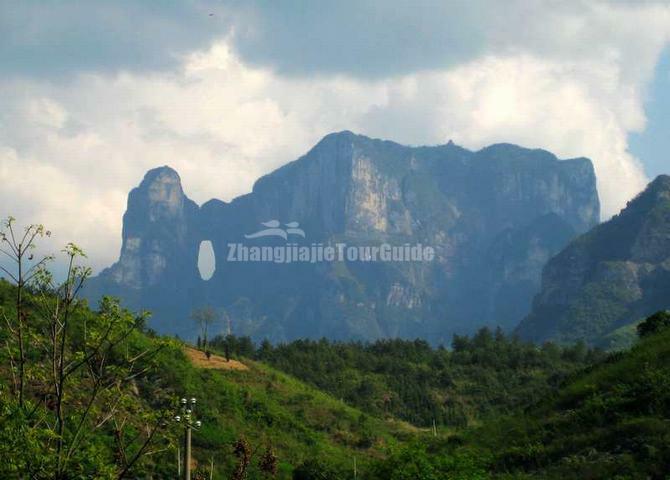 Looking around in the summit, the sixteen peaks of Tianmen Mountain are different in shape; looking afar, the scenery of the Wulingyuan Scenic and Historic Interest Area comes into view; looking into the city, the new appearance of Zhangjiajie is taken in at a glance. 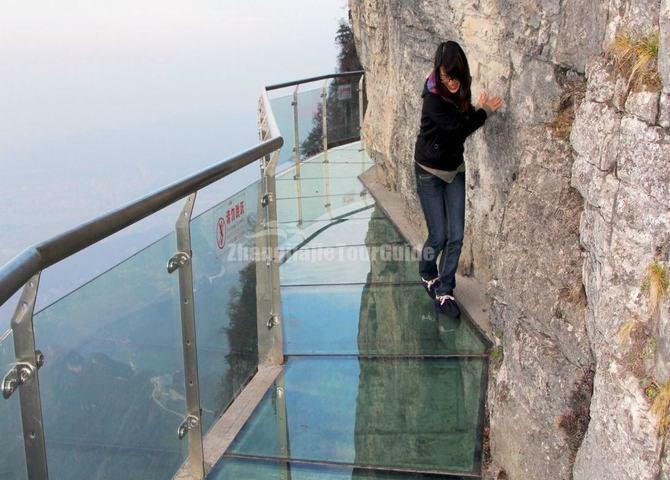 Jutting out from a sheer cliff 1,430 meters high, the glass walkway in Tianmen National Forest Park offers sightseers terrifying thrills and clear view of the mountains below as they tread nervously across the 60 meter long bridge encircling the vertical cliffs of Tianmen Mountain. The 3ft-wide, 2.5in thick glass walkway is so scary that sightseers are requested to wear cloth slip-ons over their shoes when they cross the walkway, presumably to make the job easier for the cleaners. Inviting comparisons to the Grand Canyon "skywalk" in Arizona, USA, the passage joins the west cliff at the Yunmeng Fairy Summit, where Tianmen Mountain and Zhangjiajie meet. Tianmen Academy, built in 1303, the seventh year of Dade Period in Yuan Dynasty. It was destroyed in a battle in 1352. The present one is a rebuilt one on the original site. It is a cultural holy place of Tianmen Mountain.